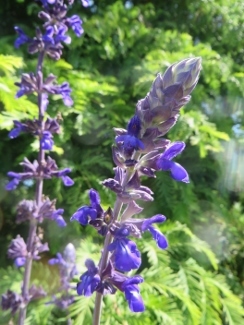 Joy Creek Photo Archive (c) all rights reserved Every year we look forward to seeing Salvia 'Indigo Spires'. Some years it makes it through our winter; some it does not, and we must replant. This sterile hybrid was found by John MacGregor, a horticulturist at the Huntington Botanical Gardens, and was introduced to the trade in 1979. The large shiny leaves are lightly charcoaled along their edges emphasizing the dense whorls of dark flowers set in very dark purple calyces. Summer to frost. 4 ft. x 4 ft.